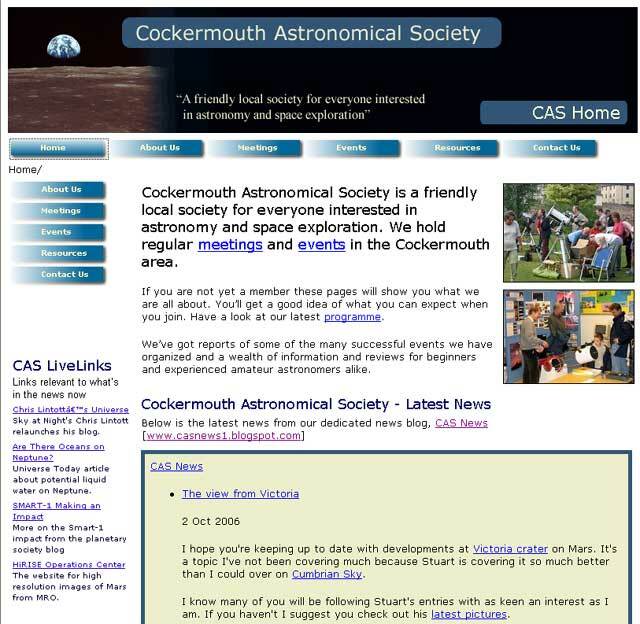 Cockermouth Astronomical Society: Coming soon . . . . I hope to go live with the revised site over the next few days. The main changes are a simplified navigation system with everything in one of five main sections. I've also included the latest blog entries from CAS News directly on the front page so you can read the full articles there. I've removed some stuff that simply wasn't being used. The most important thing about any website is the content, and although I've updated some information, and added a couple of new reviews, much of it is the same. That's where I need your help . . . . This is after all a society website, not a personal website, so it would be really good to have some contributions from society members. I'm not asking for long articles, just a quick review or website recommendation etc would be great. Have a look at the type of things that are there now, you'll get the idea. As always any ideas, comments suggestions etc will be gratefully received. I was thinking of simplifying my Introduction to Astrophotography presentation for the web. Also, I can do you a review of ImagesPlus software.